Okay... So we finished the book by Gene Simmons titled "On Power". What a great book that was!! As you can see from all of the posts we have already written this year there was a lot of good information in that book to share with you guys. The crazy thing is we didn't even share all of it with you guys. So please pick up your own copy of the book if you'd like to get all of the great knowledge that Gene had to share with us. The next book we are going to be going through is called "The Secret Handshake" by Kathleen Kelly Reardon, Ph.D. This is some of the things that have been said about this book. 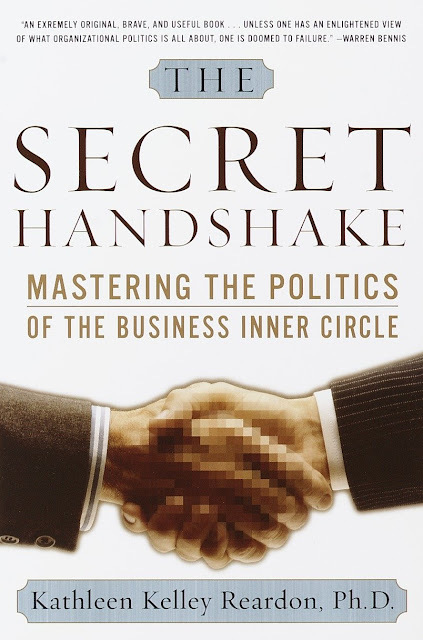 "Based on hundreds of candid interviews with executives at Fortune 500 companies who have achieved their goals and joined the inner circle, The Secret Handshake lays bare the unstated conventions that govern and shape corporate hierarchies. Taking readers inside boardrooms to learn firsthand how the top decision-makers view and assess the employees under them, it offers invaluable advice on such career-building tactics and skills as getting noticed, networking, persuading others, knowing which battles to fight, and mastering the art of the quid pro quo. For all those who aspire to be part of the decision-making body of their organization, The Secret Handshake is the ultimate intelligence report on whom to trust and whom to watch out for, how to manage the inevitable conflicts that will arise, and how to read between the corporate lines." "I read a little bit and I was hooked...full of practical advice illustrated by the kinds of point-making stories that they tell in business schools: knowing your own political style (and when to change it), forming relationships, recognizing political naturals, managing conflict, creating niches, defusing heavyhanded games. Most of her strategies emphasize constructive engagement. I liked The Secret Handshake so much I gave a copy to my daughter." We are excited to get reading this book and to start sharing the knowledge we gain from this book with you our community. If you'd like to follow along with us in this book please pick yourself up a copy and get reading. Next week we will start with our first lesson.